Painting on Lace - The great power of lace inspired Fred Fabre's exploration of the sensuality of iconic fashion accessories. Fred Fabre’s paintings are inspired by the great power of lace. In this solo exhibition he presents a suite of twelve paintings using lace, not only as background but as support. The lace is stretched then glued to the canvas over which Fabre paints a wash of colour in acrylic. He then paints richly coloured images in oil paint, in a vivid expressive layering, also retaining the ‘textures’ held within lace. Because lace has no stereotype – it has the potential to encompasses/embrace or to carry all symbols of femininity – it was the obvious choice for Fabre’s exploration of the sensuality of iconic fashion accessories. This choice of imagery is symbolic and may be equivocal however Fabre’s intention is to acknowledge that these symbols have now been reclaimed by women, while also acknowledging that the work is filtered through his perspective as a male artist. (In his previous video/film work Fabre has also been known for challenging male-centered narratives about gender relations ‘UNDO’ https://www.facebook.com/undo01/). 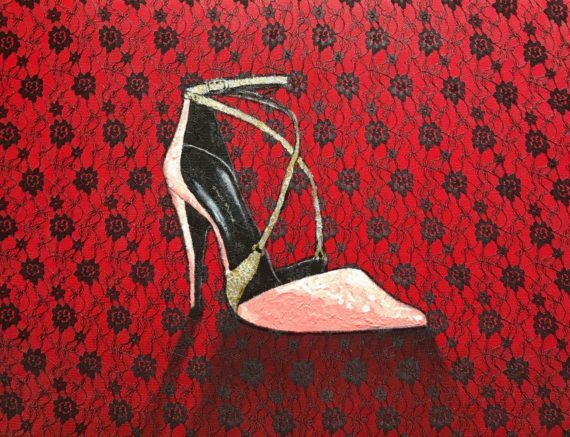 By painting on the lace covered canvas he brings images such as a stiletto, a lipstick or snails kissing, the latter surrounded by flowers and beautiful, suggestive soft bursts of colour. Here Fabre expresses the idiosyncratic view of pleasure beyond any idea of pleasure as instant gratification – when determined by patriarchal perspectives. There is desire here, for the work to hold a feminine approach to sexuality. There is a light touch here: in the piece titled ‘Scent’ the flowers become welcoming vulvas spreading a scented aura which attracts a colorful butterfly. For Fabre the expressionist style of the paintings underscore a poetic approach that opens them to various interpretations. He shifts register as well: in the work ‘I’ll catch you‘ there’s a playful use of the triptych depicting stylized spiders running over a cobweb made of lace alongside these other works of highly wrought depictions of female accessories. The french poet Louis Aragon’s maxim ‘the future of the man is the woman’ is an appropriate inspiration for Fabre’s body of work.